↑ Soviet Prisoners of War: Forgotten Nazi Victims of World War II. ↑ Michael Hope: Polish deportees in the Soviet Union. 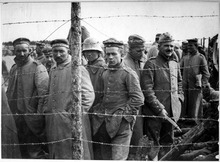 ↑ German POWs and the Art of Survival. ↑ German POWs in Allied Hands—World War II.